, on page 94. I made a few adjustments – low-fat milk, non-fat yogurt, no cilantro, a bit less meat, they called for 1½ lbs but I found 1 lb was plenty. It is a very hearty dish and tastes fantastic. I served it over rice with Naan bread on the side for scooping it up. Yum! Be sure to wear disposable gloves for the chile, makes it easier and no worries about getting the hot oils on your fingers (and later your eyes or mouth!). If you do like heat leave the seeds in, I have found that Serrano’s have plenty of warmth on their own though. If you cannot find one just use a Jalapeno instead. And on the lamb? I find it in 1 pound packages in the meat department, next to the ground bison. 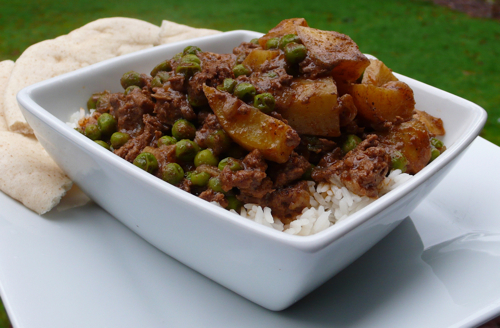 Lamb can dry out quickly when cooking, this dish keeps it moist and most of all…doesn’t have a strong lambert taste. Serve over rice and with Naan bread on the side for scooping.